The postcards reproduced below date from some time after 1900 and were produced no later than the 1930s. During that time, photography was in its infancy, with all film using only black and white negatives, taken using large clumsy cameras mounted on tripods, with quite slow shutter speeds. In order to make the picture appear to be taken in colour, companies that produced postcards employed a ‘small army’ of workers to paint over the finished cards in water-colours with a few basic colours, to give the desired effect. All too few such cards remain today but, at least they do help us get some insight into those early days. Many postcards were produced in the first decade of the 1900s. 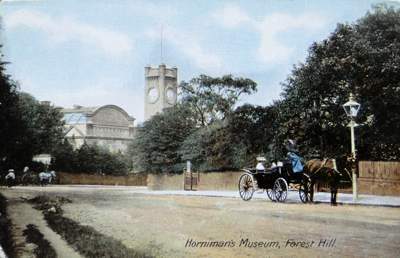 Horniman Museum opened in 1901 so it is likely that this picture was taken soon after 1901. The ladies out with their dog are dressed in typical Edwardian clothes. In one sense this view has not really changed because it would still be possible to match this view today which is taken near the lower end of Sydenham Hill, near the junction with London Road. What has changed is the look of the street. The long low wall has gone and what were quite large houses have been replaced by many smaller ones. It may be that the carriage on the right has stopped to allow the passengers to mount or alight. Notice too another stationary carriage at the far left of the view. The house which once stood on the high ground in today's Horniman Gardens because the Surrey-Kent boundary ran across London Road just a few yards down the hill from the clock tower of the museum. This land was therefore on the Surrey side of that boundary. 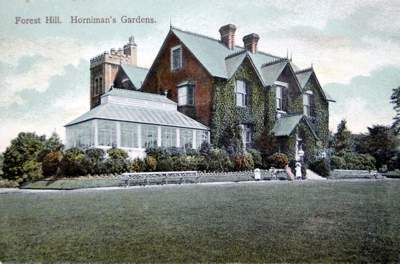 The house, which was the home of Frederick John Horniman (died 1906) who built the museum, remained standing in the gardens until the 1960s. The house was then demolished but the large tower, seen on this picture behind the house, was left for a few years more. That too was finally removed and the site has been grassed over. On very dry summers the grass discolours above the outline of the walls whose foundations are still in the ground. 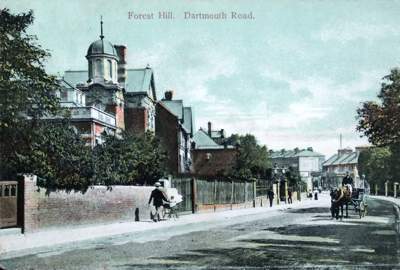 The view is taken from a short distance along Dartmouth Road, looking towards the site of Forest Hill Station. 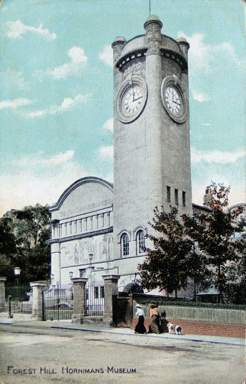 This grand structure, whose clock was destroyed in the Second World War, remained until 1972 when it was demolished to make way for the open approach road and the present uninspiring building. 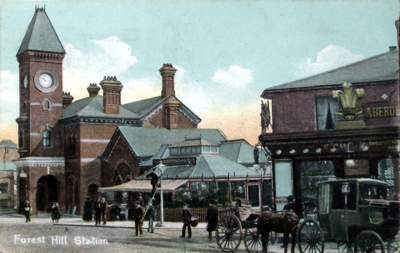 To the right of the station building on the postcard is what appears to be a large conservatory. It was, in fact, a fruiterer's and florist's shop. The site is now occupied by W H Smith’s whose shop adds hardly improves the architectural scene. The building on the far right of the card is still standing. To the right of the ‘Three Feathers’ are the first few letters of the name ‘Aberdeen House’, so-called because it was a butcher’s shop. The owner was Fred Chalk and the letters 'F CH' can be seen on the name board. The premises are now used as a betting shop. This postcard is very similar to the one above. It has been included because it is rather like a 'wide-angle' view of the scene above which is the 'close-up' version. The view shows more of the London Road junction with Devonshire Road and Dartmouth Road. Note the lamp-post in the middle of the road! This card also shows the name 'ABERDEEN HOUSE' on the side of the butcher's shop on the right (of which details are given beside the image above). 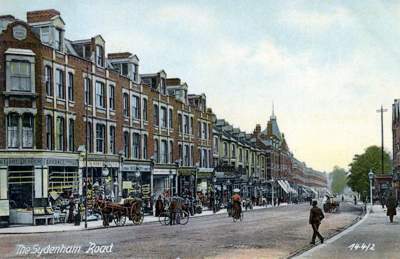 By walking from Forest Hill Station, along Dartmouth Road and then looking back, the observer would see the scene on this postcard. The Library is seen on the left, along with the gabled roof-line of Louise House. What makes the scene a little strange is that the long brick wall on the left is now a road junction where Thorpewood Avenue joins with Dartmouth Road. The scene in the far distance has hardly changes. The two rows of shops are still there, divided at the point where Clyde Vale runs down towards the railway. Walking to the end of Dartmouth Road, we reach the T-junction with Kirkdale, which is our next postcard. 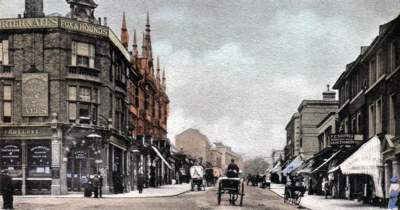 At the time of the card, this part of Kirkdale was known as the ‘High Street, Sydenham’. The photographer was either in the middle of the road, taking his chances with the small amount of traffic that was using the road, or probably taking the picture from near the kerb. The building on the corner, to the left the is the Fox and Hounds pub, at the junction with Wells Park Road. The pub is still standing at the end of the elegant terrace of shops known as ‘High Street Buildings’ a name remaining on the stonework to this day. This view looks down Sydenham Road from a point near the junction of Venner Road. 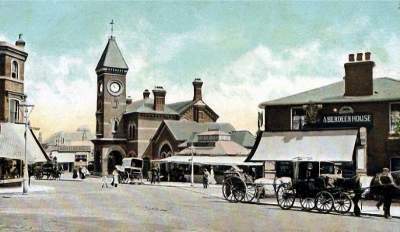 The building on the far left, that appears to have a shield in the stonework at the the top, is on the corner of the junction with Silverdale. The stonework ‘shield’ carried the words ‘Sydenham Fish Market’ until the Second World War when the lettering was smashed off so that, if there had been a German invasion, there would be no sign to identify the location to the enemy. The red-brick terrace continues down the road. Then we see the terrace continue with houses built of stock brick (as it does to this day). Then we see another red-brick terrace, then called ‘Grand Parade’, with a really high turret on one of the houses. That high turret was above one of the old-fashioned Sainsbury’s shops. This fact can be verified by looking at the front where some of the ‘Sainsbury’s’ lettering is still visible. 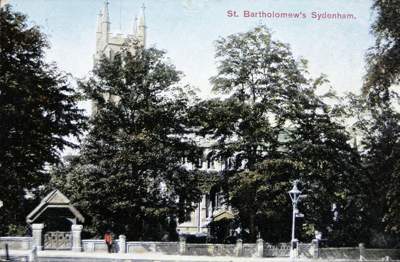 The view extends as far as Mayow Road where, at the time of the postcard, there was a large tree on the corner which can just be seen in the far distance (it is pale green in colour). About five minutes walk from Sydenham Road is what we now call Mayow Park. 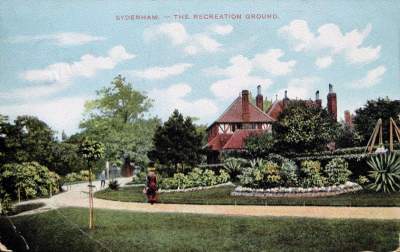 It was officially opened in 1878 as 'Sydenham and Forest Hill Recreation Ground'. It is Lewisham's oldest municipal park. This view looks towards one of two sets of gates beside Mayow Road. The gates, seen towards the left, are the ones nearer Sydenham Road. Parts of the building whose red roof can be seen still remain in the park. The paths remain unchanged in layout from its original opening but the flower-beds are not so grand as they once were. 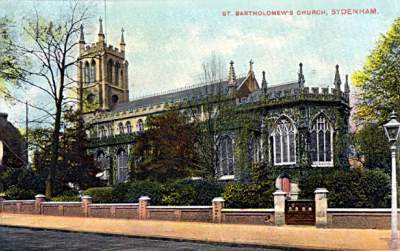 Apart from the blue in the sky, the postcard does not really appear to be in colour at all. Apart from the trees obscuring the street view of the church being cut down, the only other changes are the people and the lamp post. The awkward viewpoint means that most of the church is hidden by trees but the top of the tall tower is still recogniseable. The lytch-gate, with a dedication to Mayow-Wynel-Adams, is still a feature of the churchyard. In this view, the trees play a less prominent part and we see the view more like it is today. This postcard rather lacks much colour. It shows the large house, called Longton Hall, that by the time of the card had been converted for use as Sydenham High School for Girls. 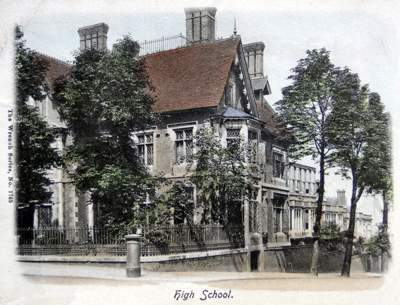 The house had been a 'hydropathic hotel' and later the first home of Sydenham High School for Girls. The view looks westwards along Longton Grove from the junction with Westwood Hill. The large elegant house, which gradually declined in its latter years, was finally taken down some time around the 1970s. 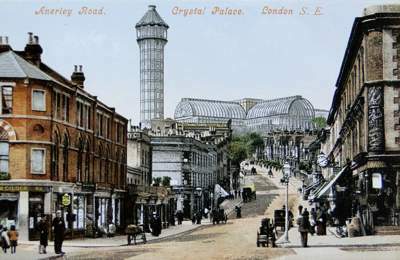 Crystal Palace and the park lie outside the boundary of Forest Hill and Sydenham but their history has played such a large part in the areas Victorian life that this and the following postcard have been included. This view looks almost due north from what is now a cross-roads controlled by traffic lights. On the left hand edge of the picture is a turning called Farquar Road. 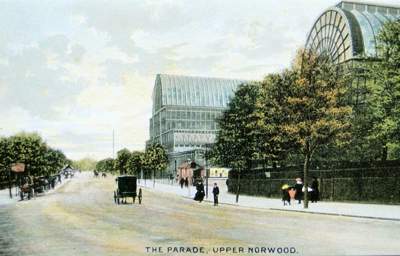 Where the trees are to be seen on the left was where the high level Crystal Palace terminus station was situated. Sadly, the Crystal Palace itself is no more. The only remaining structure beside the right hand pavement are some of the original iron railings near the original main entrance to the building. This postcard shows a view looking up Anerley Hill. It is not within the Forest Hill and Sydenham boundary but it gives a very good idea of what large structures the 'palace' and the towers were. It helps to give some idea of how the view of them dominated the whole area. It is a shame that no similar pictures survive showing the view from say Westwood Hill. Note: A pdf document (in A4 format) is available on the 'Keep and Share' Website. It contains all the images and text shown on this page, as well as additional images to help to explain the views on the Edwardian postcards.